I'll be honest, I'd never really considered this a film I'd be covering when I started the blog, thinking my time would be spent watching post-apocalyptic survival stories or tempered black and white voodoo tales from the new world. The name, the cover and what I presumed I knew all pointed to the Frankenstein's Monster myth and something I'd always considered outside my remit. I recently put my thoughts down, cementing a position that a corpse brought back to life isn't the same a corpse reanimated but still very definitely dead. 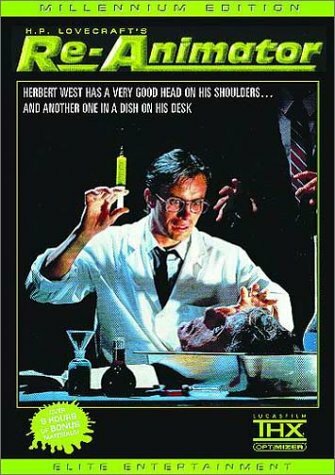 There was a problem though, unlike any of the dozen or so Frankenstein retellings I kept seeing Re-Animator on best zombie film lists. 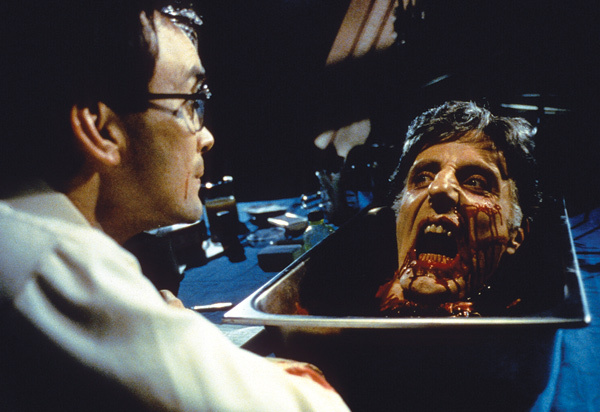 There's the name too, Re-Animator implies reanimation and not necessarily bringing back to life. So here we are. First off I'm a lucky boy as it's not often one gets the chance to watch a firm cult favourite for the first time, finding yourself thoroughly in agreement with all the praise and plaudits it's received. However, the way in which the film plays with, and challenges the defintion and absoluteness of what it is to be alive or dead, it's thrown a huge proverbial spanner into my what-is-a-zombie-and-what-isn't dogmas, just as I thought I was getting a handle on it all too. 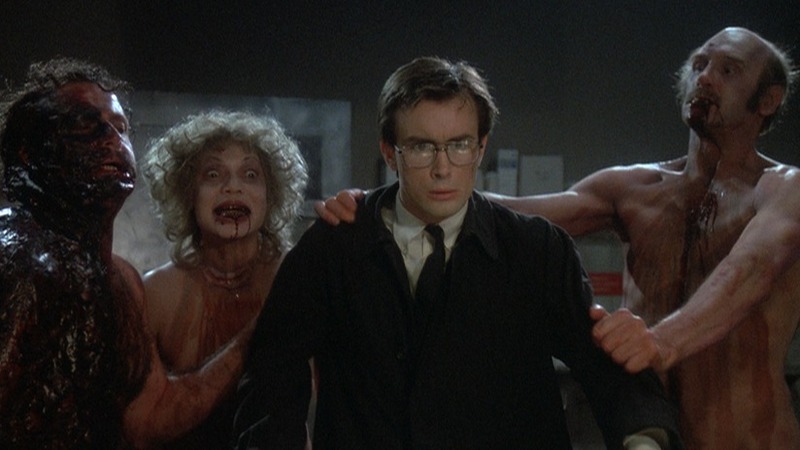 Jeffrey Combs is Herbert West, a young brilliant but misguided medical student who has come to Miskatonic University in New England, from the University of Zurich, Switzerland to further his research into resuscitating the dead. Armed with a luminous green resurrection goo Herbert believes is the key to resurrection and immortality he wins over his house mate Dan Cain (Bruce Abbott), persuading him such is the importance of this discovery he should throw ethics and common-sense out the window and help him with his last few field trials. 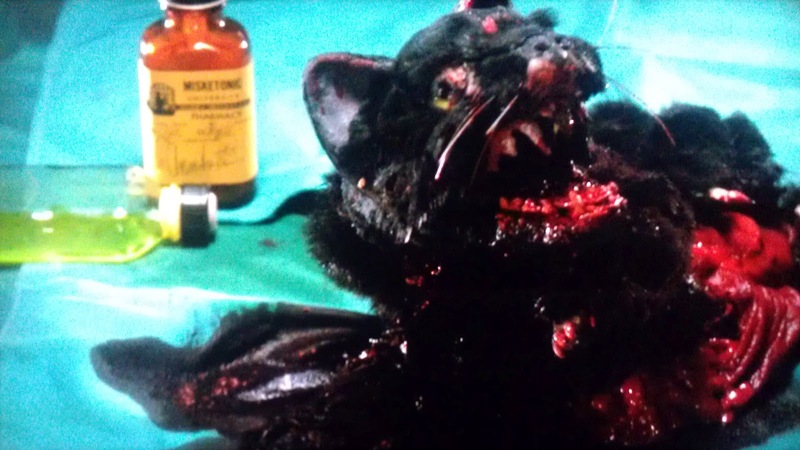 It's goofy, stupid; and from the start the perfect 80s camp horror comedy full of gratuitous gore and outlandish ideas. West aided by Dan does succeed in raising the dead, but it doesn't go without a hitch, and in trying to fix their mistakes the pair only make things worse. It's perfect train-wreak cinema; watching an inevitable chain reaction of events leading to carnage and chaos. Director Stuart Gordon has paced it all to perfection with the onscreen lunacy and action increasing by orders of magnitude to a truly spectacular explosive conclusion. So Herbert West has brought them back to life right, so they're not zombies? It's not so simple. The brain, West's new teacher, Dr. Carl Hill (David Gale) tells him, can only last for between 6 and 12 minutes after death before it's irreparably lost, and it's this idea that dictates the behaviour of those brought back, and also has caused me to question what I consider dead when it comes to the modern zombie. I've reiterated recenty my new respect that the concept of zombie is ambiguous, changeable and contains more wiggle room than I'd previously entertained. West's reanimated have been dead, but are now upright and breathing. They're alive but they're brains are all but completely destroyed leaving them only primal instincts and the ability to respond to rudimentary sensory stimuli. Even Dr. Hill confronting West over the state of Dean Alan Halsey (Robert Sampson), an early accidental casualty of West's mishandling and over exuberance, proclaims they both know the now shambling, groaning shell of man is clearly 'dead' in all but name. One thing I was steadfast in though was my belief a zombie should, phenomenally putting it, embody a little deadness. While I've been guilty of previously of reducing this to lack of pulse and heart-beat as well as absence of consciousness and conscience perhaps I need to think bigger as these reanimated cadavers clearly embody zombie; albeit with a little blood flow. Anyway, further through the film West successfully reanimates detached body parts, the whole film tumbles into the absurd and all these points kind of become moot. Heads and bodies clearly can't be 'alive' in any real medical sense but here they are quite animated and independent, yet possessing some 'fanciful' ability to still interact. At this point it's no longer worth the pseudo linguistic philosophical torture and I'm happy to hold my hands up and get with the japery and carnage. I've rambled on at length but not really mentioned the film. The narrative may be daft and eccentric but the film is coherent, cohesive and another perfectly pitched horror comedy in the vein of Evil Dead II or Dead Alive. The laughs come from the absurdity of the action rather than overt jokes and the consummate deadpan; dead straight acting from all involved elevates what could easily have been quite the b-movie into something that feels both grand and competent. The effects and gore are constantly superb with some truly memorable and totally disgusting sequences that will stay with me forever. The reanimated actors are some of the best and if an award was to be given for best naked zombie fight this would win hands down. There's a simple reason some films attain cult status and spawn a host of sequels and pretenders; it's because they're that good. A captivating, audacious over the top cinematic experience full of memorable scenes and dialogue, and responsible for me having to think a little harder about what is or isn't a zombie, 9/10. As the Blu-ray release is R(A/1) locked I reviewed the unrated Millennium DVD edition which is 9 minutes longer than the theatrical release and seems to be the most complete.